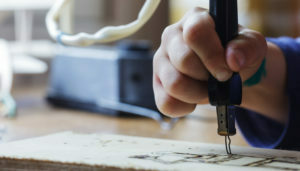 Woodburning, also known as pyrography, involves drawing an image on wood with a woodburning pen. There are plenty of crafts involving wood out there to choose from, but this one is exceptionally popular. Burning designs and drawings into wood is lots of fun and a great stress-relieving activity, allowing you to have a creative outlet while doing mindful tasks. But the best part of woodburning is that, along with being relaxing, the process results in something beautiful to show for it when you’re done. You can do it for yourself, or to give as a completely unique, one of a kind gift for a loved one. And, with the right techniques, you’ll be churning out nice looking projects in no time. We all know that one relative or friend who is impossible to shop for or who already has everything they want and need. This is why knowing how to create beautiful, handmade gifts is a great skill to have. Plus, wood is a versatile and attractive material that complements most types of décor. It works wonders as the base of many handmade gifts that are almost always appreciated by whoever receives them. Of course, you will want to have a grasp of some basics before you get started, such as the proper safety measures to take and making sure kids are supervised while woodburning. You will also need to purchase a quality tool for woodburning. Once you do this, you are ready to begin and you’ll soon discover that the ideas for what you can do with this skill are endless. Let’s look at some unique woodburning ideas you can start with. Most of us have seen at least one of these before. Perhaps you have a business that could use a sign over the door, or you simply want to let visitors know where the Johnsons live the first time they come over. 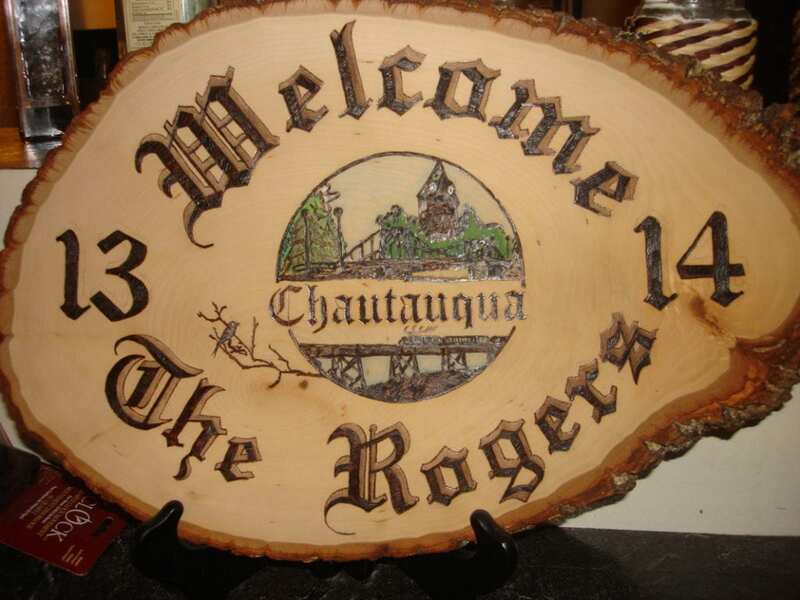 Either way, a woodburned sign is a classic, earthy-looking, and elegant way to do this. A wooden kitchen set, complete with spoons and a spatula, can be a good gift choice, but you can make it personal (in addition to practical) with some added designs. You don’t have to be an artistic genius to make something nice; simple patterns will look great, too. Or make your own set and hang them on your kitchen wall as decorations instead of using them. Do you know someone who loves the outdoors or tends to dress in natural or nature-inspired tones? 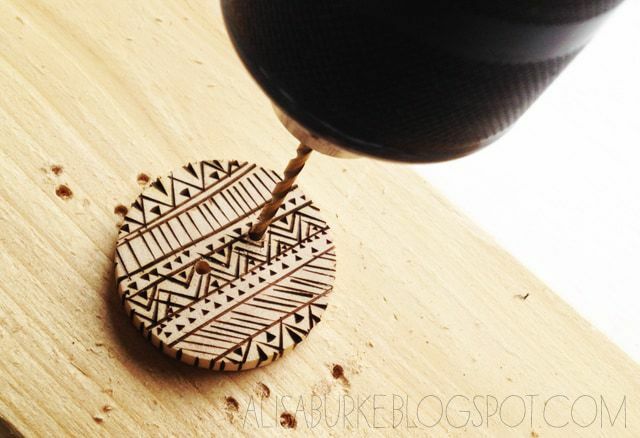 Then woodburned buttons are a great gift idea. These are an especially nice addition to knitted or flannel clothing. You can do simple dotted designs or something more elaborate according to your personal taste. 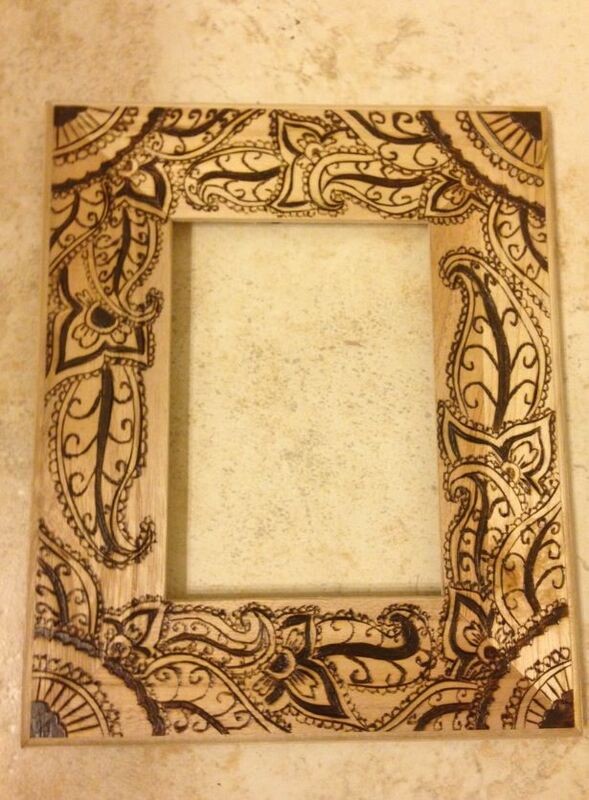 Framed photos are a classic gift idea, and making etched designs around the frame makes it even better. The best part of this project is how personalized you can make it. For example, if you are framing a photo of a fishing trip, you can etch relevant designs, like swimming fish and hooks, around the photo. For a framed picture of your son’s baseball game, make little pictures of baseballs and baseball hats along the edge. This is another creative idea (like the wooden spoons) that can be made for practical purposes, as a gift, or simply as something nice to hang in your kitchen. If you know someone who loves to cook, this is the perfect chance to get them something they’re sure to use. 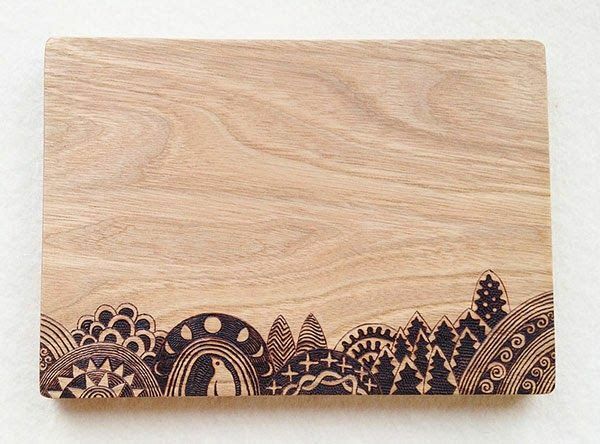 Abstract designs or nature-inspired themes (like leaves and vines) look great on cutting boards. If you’re expecting, know someone who is, or already have a small child that could use a new toy, look no further. 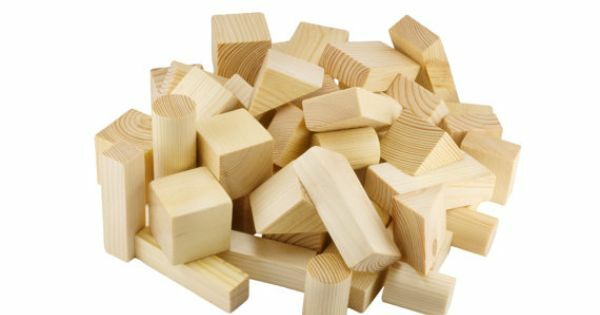 You can create your own wooden building blocks at home. Go with the classic alphabet design or create toy buildings. In this day and age, where most people buy easily replaceable toys for their kids, a handmade gift like this is sure to impress and last a lifetime. Read more detailed instructions on how to create these here. 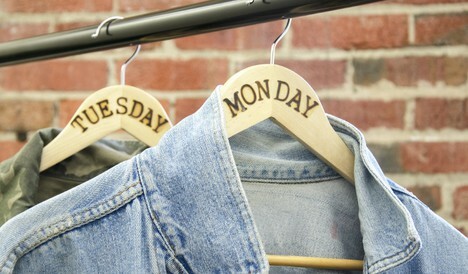 Have some old coat hangers made of wood in your closet? 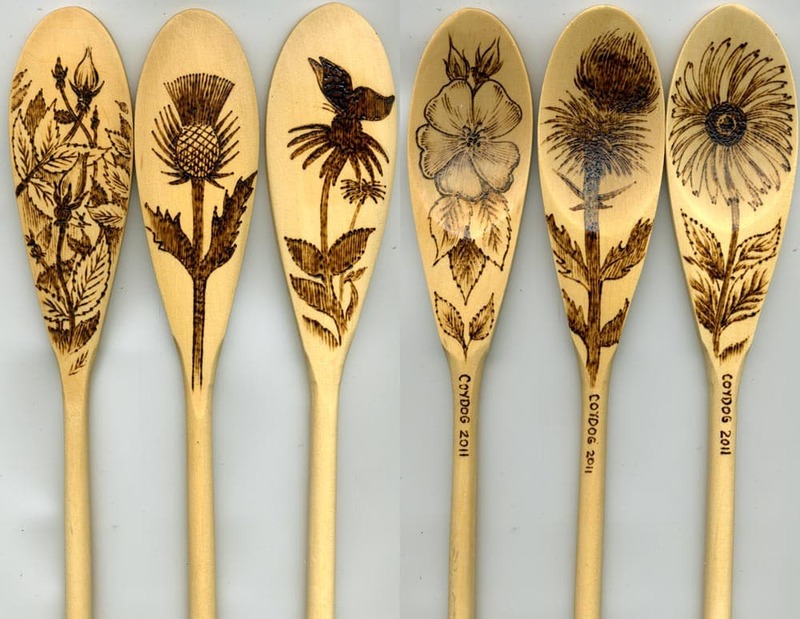 You can spruce them up by adding some woodburned designs. Make flowers, mandala patterns, or simply etch the days of the week onto your hangers so you can plan ahead with the shirts you’ll wear to work and have an easier time getting ready in the morning. The most commonly used woods are poplar, birch, and basswood, and they have lower levels of toxins. Pine is a popular choice as well, but creates more fumes than the other three types. To find out more about woodburning safety and toxicity and ensure you take the proper precautions, read this article. Life is too short to give gifts that no one will remember, or to hang decorations in your house that are generic and boring. The ideas above should get you started, but once you begin, you’ll find plenty of surfaces to improve with your woodburning pen. Looking for more ideas? Check out some of our favorite free printable wood burning patterns.